In flight TV is all the rage with Low Cost Carriers because it opens up a revenue stream without the complexity of managing a video on demand system. Unfortunately streaming live TV comes with a lack of editorial control. Here is a photo of me watching a Jetstar TV advertisement while sitting in a Virgin Blue seat somewhere between Sydney and Melbourne. That is 192 people looking at your competitor's brand while consuming your product. 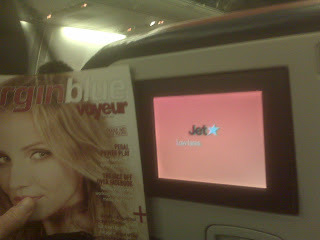 It does indeed open up an airline's inhouse media channels to competitors as your photo indicates. I think a bigger issue for Virgin Blue is just how many passengers are actually swiping their credit cards to pay for the free-to-air TV channels. My experience (and I travel with them a bit) is that just about every screen in view down the cabin (I like to sit at the back)rolls through the default channel with its paid-for adverts for the entire flight. Am sure the airline had great hopes for this additional pay-per-use revenue stream but, let's face it, unless there's an insert-your-favourite-sporting-event-here on while you're in the air, would you really pay for an hour's TV viewing? @PA - I agree. There is a nasty trap here. Pay per view movies are expensive to load and manage because you have to change the roster every month or so and distributors will charge you more than Pay TV operators for a rebroadcast licence. This makes inflight TV more attractive. But inflight TV holds you hostage to what is on air at the moment. Who wants to pay $5-10 to watch half a episode of the Simpsons or the beginning of a Law and Order. DJ have notices this and are doing a little bit of both. They have pay per view movies on longer flights for $10. I imagine their toes were curling a year or so ago at the sight of the sizable humps housing the inflight TV equipment on the exterior of their aircraft. Drag's fine at Mardi Gras but not fab when fuel's nudging US$150 a barrel.